Bill Benson (Bing Crosby) has just wrapped up his latest smash show, and is set to open a new one on Broadway in eight weeks. His manager coerces him into hiring young television star Ted Adams (Donald O’Connor) to be his costar in the new production. The only problem–besides the performers’ respective egos–is their lack of a leading lady. Bill tells Ted that he will take on the responsibility of finding and hiring a costar. He heads to London, and Steve Blair (Phil Harris), father of talented young actress Patsy (Mitzi Gaynor), manipulates Bill into seeing her perform. Bill hires her on the spot and travels to Paris to meet Ted and tell him the good news. 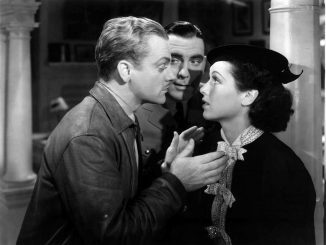 What Bill doesn’t know, however, is that Ted has fallen hard for French ingenue Gaby Duval (Jeanmaire) and has promised her the leading role. Bill tells Ted to pay Gaby off and release her from her contract before they are all scheduled to hop a steamer back to New York. But Ted cannot bring himself to let Gaby down, so he sneaks her onto the ship. But before too long, Ted is taking moonlit strolls with the sweet and determined Patsy, while Bill finds himself drawn to the confident and forthright Gaby–and neither man wants to tell the women the truth, even as they sail ever closer to Broadway. Anything Goes first appeared on Broadway in 1934, the result of a collaboration between writers Guy Bolton and P.G. Wodehouse and composer Cole Porter. That production resulted in the creation of some of the most noteworthy tunes in the Porter songbook, including “You’re the Top” and “I Get a Kick Out of You,” and was adapted for the big screen by Paramount in 1936. That version, which also starred Crosby, followed the stage production relatively closely in plot, though some of the saucier elements were excised from the screenplay. But twenty years later, when Paramount sought to remake Anything Goes, the original material was almost entirely thrown out by new screenwriter Sidney Sheldon. Crosby’s character, once a young Wall Street banker, became a seasoned musical star instead, with a fresh young partner and a love quadrangle thrown in for good measure. In actuality, about the only thing that survived from the first film’s screenplay is the ocean liner setting. Anything Goes marks Bing Crosby’s final film under his long-term Paramount contract. He had originally signed with the studio in 1932, after appearing in several films and Mack Sennett shorts as a singer, and made his leading-man debut in 1932 in the first Big Broadcast film. By the time filming commenced on the second version of Anything Goes, Crosby was fifty-two years old, an Oscar winner (for 1944’s Going My Way), and a musical film icon–and he was typically playing romantic roles opposite much younger female co-stars, which only served to highlight his advancing age (for instance, in 1954’s The Country Girl, his character was married to twenty-four year old Grace Kelly, whom he would pursue again two years later in MGM’s High Society) . Anything Goes makes a bit of a joke out of this fact, with O’Connor’s character christening Crosby’s “Pops,” but seeing him romance the twenty-one-years-younger Jeanmaire is still somewhat cringe-inducing. With this film, we finally see what White Christmas (1954) could have been with O’Connor as Crosby’s musical partner. O’Connor had originally been slated to play Phil Davis opposite Crosby in the earlier film, but had to drop out before filming and was replaced by Danny Kaye. [Still, it’s worth noting that this was not the first movie in which both Crosby and O’Connor appeared; 1938’s Sing You Sinners featured a twelve-year-old O’Connor as Crosby’s younger brother.] It’s a solid pairing: Crosby and O’Connor play off one another quite well, particularly in the opening number, “Ya Gotta Give the People Hoke,” a lackluster lyrical piece that is saved by the pair’s slapstick antics. The female leads are similarly well-cast, and for the most part, they manage to hold their own opposite their more seasoned male costars. 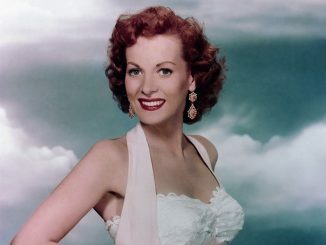 Gaynor cut her teeth on almost a dozen movies throughout the first half of the 1950s (including a substantial supporting role in 1954’s There’s No Business Like Show Business, in which her Anything Goes love interest, O’Connor, played her brother). Here, she is delightfully self-assured as Patsy, hoofing it across the screen with vigor (her “De-Lovely” pas de deux with O’Connor is a particularly gorgeous number). By contrast, Zizi Jeanmaire was a famed ballerina and relative newcomer to film, having only starred in a single production (the 1952 musical Hans Christian Andersen) before appearing in this movie, and her inexperience shows at times throughout the picture. Still, even when her accent becomes so thick that her dialogue needs a bit of interpretation, Jeanmaire’s utterly divine dancing speaks clearly for her. The appealing performances aside, the main problem with Anything Goes is that it borrows heavily from other sources while bringing nothing new to the genre. 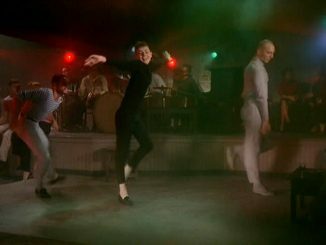 It’s merely a broad amalgamation of musical tropes–for example, Gaby’s balletic dream sequence is reminiscent of the “Broadway Melody” sequence in Singin’ in the Rain (1952); O’Connor’s secretive behavior in trying to hide Gaby from Bill reminds us of Kaye’s similar machinations with the Haynes sisters in the aforementioned White Christmas. And when the film does try to inject a note of originality, it fails spectacularly–particularly in the addition of a mysterious subplot involving Patsy’s father, Steve (Phil Harris), which is an unnecessary distraction from the main plot that only serves to bog down the film. The recent Warner Archive DVD release of Anything Goes is, like most of the manufacture-on-demand series, short on extras, but unlike many other entries in the WA collection, the disc does include subtitles. The film itself is a good print and is presented in widescreen (having originally been filmed in VistaVision). The Technicolor sequences still pop out of the screen, particularly in the candy-colored staged musical numbers. While those musical numbers are, by and large, pleasant and staged very well, it’s the bland, overly familiar stuff in between the songs that ultimately makes Anything Goes a minor entry in the 1950s musical canon. The film goes on for far too long, and though the leads put forth their best efforts here, there is little any of them can do to save the generally lazy plot from dragging on to its inevitable happy denouement. Still, the entertaining rapport between its talented performers–particularly the lovely, effective chemistry shared by O’Connor and Gaynor–goes a long way towards making this film watchable in spite of the issues with its storyline. Editor’s note: Anything Goes is available as a manufacture on demand (MOD) DVD from Warner Archive. The Irish Eyes Are Smiling at Warner Archive Instant!